According to my records, I purchased my Surface Pro 3 in October 2014, along with the Type Cover available at the time. Mostly, I’ve been pretty happy with that hybrid tablet PC, but its Type Cover has always driven me to distraction. 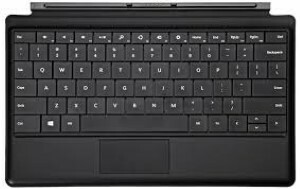 The touchpad, in particular, was trying, and the keys were closely spaced, so my typing accuracy suffered when using it. But what really kept me away from direct use of the device as a “laptop replacement” was my tendency to accidentally brush the touchpad while typing, often resulting in highlighting and deleting whatever it was I was trying to input at any given moment. For somebody whose keystrokes are literally his living, this was simply unacceptable. My wife and son love the machine, though, and it proved an able travelling device when a simple plug adapter was all that proved necessary to use the charger (and the device) for their extended trip to Germany this summer. SP3 (old) Type Cover left/top; SP4 (new) Type Cover right/bottom. The new Type Cover is backward compatible with the Surface Pro 3 even though built for the Surface Pro 4. The touchpad is much larger, made of smooth, strong glass, and easier/more ergonomic to use. The keys on the keyboard, though slightly smaller, are more widely spaced and offer a better feel while in use, all intended to promote faster, more accurate keyboard input. A fingerprint reader version that works with Windows Hello is also available, as an added-cost ($40) option. As fingerprint readers go, $40 is kind of pricy: most laptop makers charge $10 to $20 for these devices when they’re available as added-cost options, and USB models are readily available for $11 to $15, as this Google Shopping search shows. While we were out and about on the weekend before Thanksgiving, visiting the mall at The Woodlands, TX, I dropped into the Microsoft Store and plunked down $160 of my hard-earned cash for the new Type Cover with fingerprint reader, even though it is currently available only in black (other colors are in production but probably won’t be out until late December or early January). I unplugged the old Type Cover and plugged in the new one when we got to our host’s home that evening and sure enough, it was quite a bit easier to use, enabled more accurate typing, and I didn’t have any touchpad problems or issues like those I experienced when using the previous version. I also quickly realized I had no idea how to set up the fingerprint reader, and a cursory pass through control panel widgets and settings options didn’t lead me anywhere useful, either. Realizing I had to do a little research to figure out which way to proceed, I shelved the fingerprint stuff until after I returned home late Monday (11/23) afternoon. Once I went looking for the proper set-up, I found it almost immediately: Settings, Accounts includes a panel called Sign-in options. On a properly-equipped PC running Windows 10, you’ll see a Windows Hello item in that panel (it often requires a bit of scrolling down to find) where you can enroll or manage fingerprint data suitable for login (and other authentication) purposes. I’ve been working with fingerprint readers for years, and both of my Lenovo notebooks and my Fujitsu Q704 tablet all have them installed (I even wrote a mini-review for the Microsoft Fingerprint Reader for the 2006 Tom’s Guide Holiday Buyer’s piece). But though I was able to enroll my fingerprints — or so I thought — the reader was not able to read any of them. I found myself wondering if I didn’t have the 10/26 Firmware Update that added support for the Type Cover with Fingerprint Reader to the system (I did) or if the fingerprint reader might be somehow defective (it wasn’t). What was defective, it turns out, was my understanding. If you take a close look at the image for the Type Cover with Fingerprint Reader above (right/bottom) you’ll see that the sensor occupies a pretty sizable surface area (it’s square, with dimensions of just under 0.5″x0.5″ or 1.27cmx1.27cm). Having been trained on fingerprint sensors that are about the same width but only 0.125″ or 0.32cm high, which require dragging a finger across them to enroll that data for the device to use later on, I was using the same finger dragging technique on this fingerprint reader as well. However, the device simply wanted me to lay my finger down on the sensor without moving it for registration and subsequent recognition. Until I stumbled onto this information (the registration prompt says “Press your finger against the fingerprint sensor, and then lift it,” which is what ultimately clued me into what I was doing wrong) the fingerprint reader wouldn’t recognize my fingerprints. Given a proper fingerprint registration, of course the device worked like a charm. 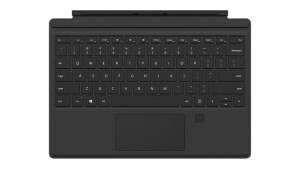 This entry was posted in Hardware Reviews, Recent Activity, Windows gadgets and tagged Microsoft Surface Pro, Microsoft Type Cover, Windows 10 by Ed Tittel. Bookmark the permalink.